Dr. Chua received his medical degree from the University of Santo Tomas-Faculty of Medicine and Surgery, Manila, Philippines. He completed his medical internship at Michael Reese Hospital in Chicago. He then moved to St. Elizabeth’s Medical Center, Boston, MA for residency. Dr. Chua proceeded to be perform a fellowship in Pulmonary and Critical Care at the same institution. He is board certified in Internal Medicine, Pulmonary Diseases and Critical Care Medicine. 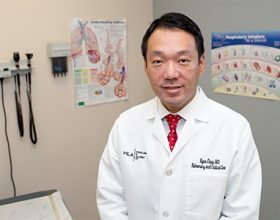 Dr. Chua has special interest in asthma (including non-pharmacologic management/bronchial thermoplasty), exercise induced bronchoconstriction (EIB), COPD, advanced diagnostic bronchoscopy, thoracic oncology and critical care. He is the medical director of the Outpatient Pulmonary Rehab at UMass Hospital HealthAlliance. He lives in Soutborough, MA with his wife Vicky who is an endocrinologist, his son Ethan and daughter Sophia.